- A Windows system with at least 1024 MBytes of RAM. - 4 MB of disk space for installation. Run TekPhone by double clicking TekPhone.exe in the application directory. Enter a phone number to Dial Number and click dial button. You can initiate an ENUM call by clicking ENUM Dial button. 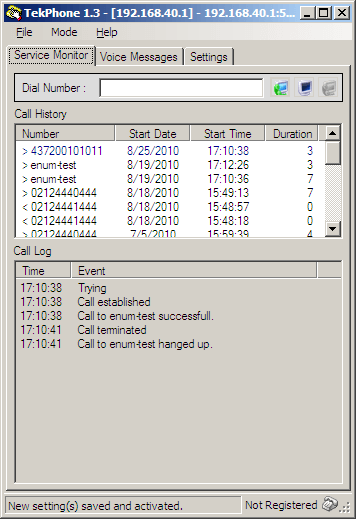 You can end or cancel a call by clicking hangup button. Logging is optional. 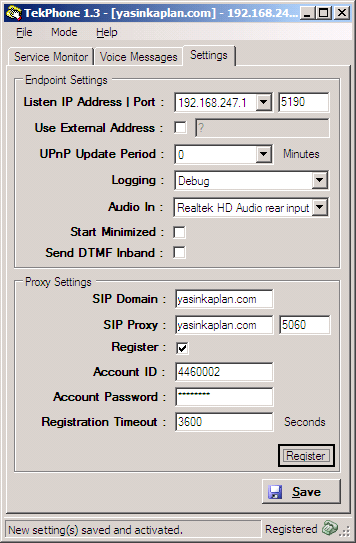 Set SIP endpoint ID (Username) and SIP Domain. If you save the configurations changes, they take effect immediately.